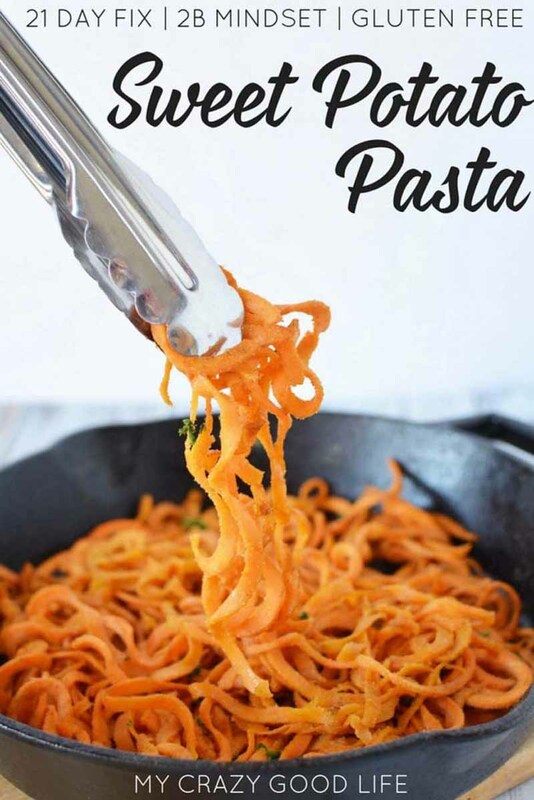 Sometimes I get a craving for pasta…when the craving strikes I like to try out some sweet potato pasta first! 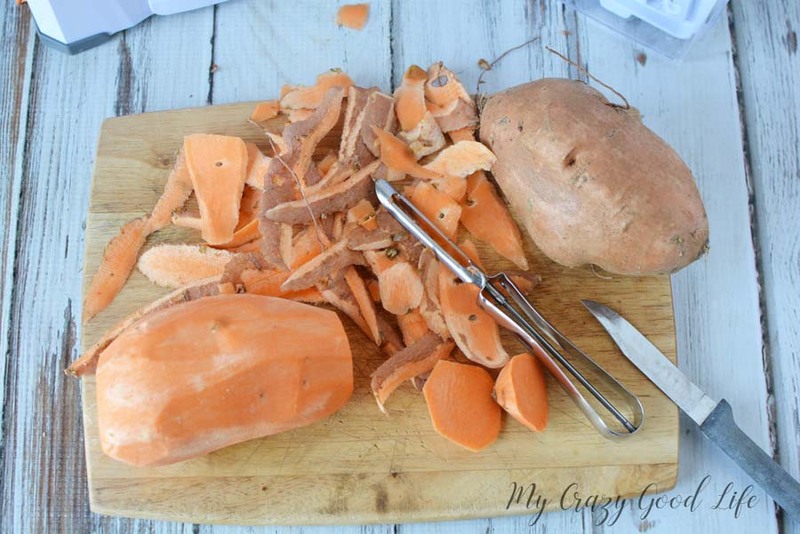 This is a great recipe for sweet potato linguini that is 21 Day Fix and 2B Mindset friendly. It’s loaded with great flavors and has lots of good nutrients for your body instead of all the sugar in processed pasta. I know that zoodles and sweet potato pasta are not the same as real linguini or spaghetti but I can’t feasibly eat those things everyday and still maintain my healthy lifestyle…so I make the best of it with delicious recipes like this! If you’ve never tried a spiralized veggie in place of your traditional pasta you should give it a go. Along with some protein and veggies it can be a delicious and healthy alternative that you actually enjoy, I know I do! How do I make sweet potato pasta? You can make any kind of vegetable pasta easily with a spiralizer. I love this one, I use it pretty regularly to make zoodles and all variety of other spiralized vegetables! It’s really simple. Once you have your potatoes peeled you insert them into the spiralizer and turn the crank. Smooth motions will keep your sweet potato pasta in long strands just like noodles. I’ve found that using vegetable pasta really cuts down on carbs and helps me keep my healthy lifestyle goals on point. 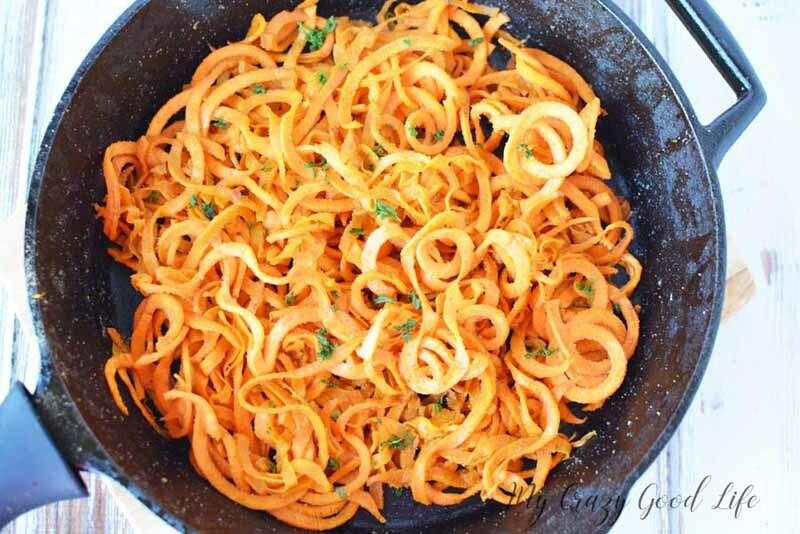 You’ll end up with a long core that comes out during the spiralizing process, you can chop that up a bit and include it or you can compost it or toss it. Just be aware if you’ve never made zoodles before that it’s totally normal! If you decide you like making sweet potato pasta you have to try out this recipe for steak fajita zoodles, it’ll further solidify your obsession with spiralizing, I promise! Sweet potato linguini and other zoodle recipes are great for anyone who might be dealing with a gluten intolerance too! They can be cooked up dairy free as well so they’re amazing for special dietary needs. Is this sweet potato linguini 21 Day Fix friendly? How about 2B Mindset? This sweet potato pasta is totally 21 Day Fix friendly. It’s also great for 2B Mindset! I’ll detail the breakdown of containers and meal ideas below so you know exactly how to count and track this delicious sweet potato linguini! The entire recipe is 6 Teaspoons and 6 Yellow depending on the size of your sweet potatoes. Use your containers to measure the potatoes if you are unsure! Depending how you decide to use this recipe, as a base, a side dish, etc. you can measure accordingly with your yellow containers. Just remember that for each Yellow you need to count a Teaspoon as well! How should I cook my sweet potato linguini? There are just a few simple and easy steps for cooking sweet potato linguini. You can have this delicious recipe ready quicker than traditional pasta and it’s healthier too, it’s a win win! 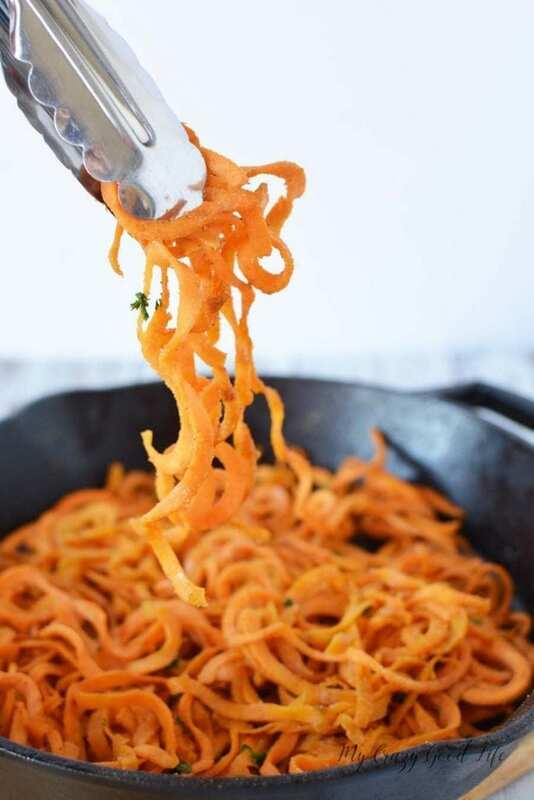 Where can I get that fantastic spiralizer to make zoodles and veggie pasta at home? When you find a great product you stick with it and that’s how I feel about this spiralizer. It’s awesome. It has three different blades for different cutting types and the newer version can actually collapse so that they lay flat for storage. It’s sturdy and works really well. I also love that it has individual suction cups to keep it in place while I’m using it. No matter what I’m spiralizing from sweet potato linguini to zucchini zoodles it’s got me covered! Sometimes I get a craving for pasta...when the craving strikes I like to try out some sweet potato pasta first! 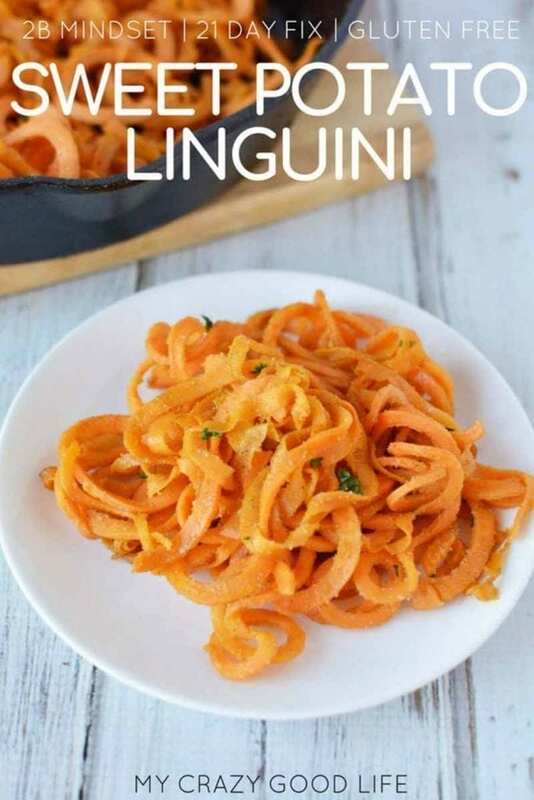 This is a great recipe for sweet potato linguini that is 21 Day Fix and 2B Mindset friendly. It's loaded with great flavors and has lots of good nutrients for your body instead of all the sugar in processed pasta. So perfect for a low carb meal! And I love how easy this is! 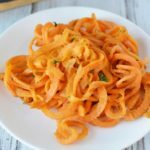 I’ve recently started to use my spiralizer again and was so happy to have stumbled upon your delicious recipe. So delicious and so easy – thank you! Would these be “poodles”?? OKay, but seriously, so delicious!!! A nice break from zucchini! Love the sage butter with these sweet potato noodles! Such a great healthy recipe! So easy and delicious.And a great alternative to “zoodles” for when you’re wanting to limit your carb intake!